It would be a beginning that few directors could match with the drama that followed. Powell does. That emotional burst, that passion for life and love, is followed through with a struggle to hang on to life once Peter survives an impossible blind jump and meets the voice at the other end, falling impossibly in love while the clerks up above note that one soul is missing from the balance sheets. An aristocratic emissary (Marius Goring) in 18th Century French finery (asked how he ended up in heaven, he references the French Revolution and explains the scarf around his neck when he remarks, “I lost my head”) is sent to retrieve the missing soul, leaving the cool monochrome sheen of heavenly majesty for the bloom of color on Earth. The line â€œAh! We are so starved for Technicolor up thereâ€ could as easily be applied today. This color has a surreal magic missing in modern films. Powell and Pressberger are as passionate about filmmaking as young poet Peter is about life. Their creativity is both fantastic and organic, their imagery spellbinding and gorgeous, and their scripting clever and witty. They never betray whether this heavenly world is real or all in Peter’s mind (the result of his blistering headaches) but neither are they coy in the play between the worlds. As Doctor Reeves observes, these visions are real to Peter, and so they are to him too. And to us. It’s a perfect romantic fantasy, a stunning creative achievement and one of my favorite films, and at long last on DVD in a gorgeous transfer that glows on the screen. We’re so starved from Technicolor here too. 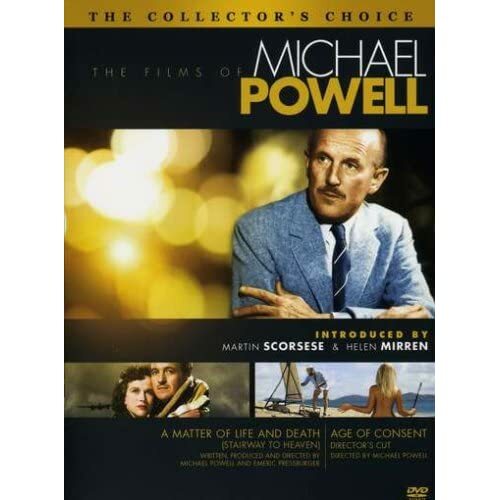 It’s part of the second “The Collector’s Choice” release, a collaboration between Sony and The Film Foundation, a two-disc/two film set entitled The Films of Michael Powell. The second feature is Age of Consent, his 1969 drama about a British painter (James Mason) who flees England for Australia to go Gauguin on a tropical island and a local girl (Helen Mirren) who becomes his muse. Martin Scorsese provides video introductions for each film and Helen Mirren shares her memories of the film in a short interview. Michael Powell historian Ian Christie provides commentary on A Matter of Life and Death and Kent Jones does the honors for Age of Consent. Dave Kehr reviews the DVD for his New York Times “Critics Choice” DVD column. Gary Tooze compares the new DVD with previous European DVD releases at DVD Beaver. Parallax View friend Robert Horton reprints his essay on A Matter of Life and Death from Film Comment on his blog here. Roger Ebert celebrated the film when it was restored and revived in 1995. The “Powell and Pressburger Pages” has a whole page of links for reviews and information here.